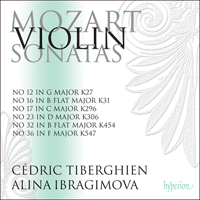 The third of the ongoing series from the ‘nigh-on ideal’ partnership (Gramophone) of Alina Ibragimova and Cédric Tiberghien. As before, the programme mixes the early—two works by the precocious ten-year-old—with the mature, and includes Mozart’s final violin sonata. Mozart’s earliest violin sonatas, written during the European tour that took him and his family to Paris, London and The Hague in 1763–66, were his first published compositions. They differ from his mature works of the kind not only stylistically, but also in being conceived very much as keyboard sonatas with violin accompaniment—a popular form of domestic music-making at the time. The first four sonatas (K6–9) appeared in Paris in February 1764, as Mozart’s Opp 1 & 2. The title-page of each volume proudly described their composer as ‘Agé de Sept ans’. The following year, in London, Mozart saw his Op 3 in print—a set of six sonatas (K10–15) for harpsichord with violin or flute; and a further half-dozen works of the same kind (K26–31) were published in Amsterdam, as his Op 4. It was when, on 11 March 1766, Mozart and his sister performed at the celebrations in The Hague to mark the eighteenth birthday of Prince William of Orange that ‘our little composer’, as Leopold Mozart called him, was invited to write this last series for Princess Caroline. With the exception of the opening work of the series, the sonatas K26–31 are all cast in two movements only. The Sonata in G major, K27, begins with a slow movement whose ornate melody seems to unfold in a single sweep. The impression of continuity is further strengthened in the second half of the piece, where, by omitting any reprise of the melody’s opening bars, Mozart effects a seamless join between the development section and the recapitulation. The finale, with its violin accompaniment in a patter of rapid repeated notes, is a simple ternary form, with a middle section in the minor. The main weight in the last of Mozart’s early works of its kind, the Sonata in B flat major, K31, is carried by the second in its pair of movements—a set of variations on a minuet-like theme. The third variation features acrobatic leaps for the pianist, with one hand continually crossing over the other. Following the constant right-hand semiquaver motion of variation 4, the fifth variation is syncopated throughout. The stream of semiquavers is resumed in the final variation, where it is transferred to the pianist’s left hand, while the right plays a version of the theme decorated throughout with trills. A dozen years were to elapse before Mozart composed any further violin sonatas. When he did so, in the early months of 1778, both he and his music had undergone considerable changes. The previous autumn he had set off with his mother on a journey that was to take them to Munich, Mannheim and Paris. In Munich, Mozart came across the recent violin sonatas of the popular opera composer Joseph Schuster, and their success prompted him to try his hand at a set of similar works of his own. Of the six sonatas K301–306, four were composed in Mannheim, while the last two were added after Mozart and his mother had reached Paris, in the summer of 1778. Mozart had, however, written a further violin sonata in Mannheim. Quite why he elected not to include the Sonata in C major, K296, in his series isn’t known: after all, he could easily have made use of it in order to supplement the four pieces he had written in Mannheim, thus leaving himself only a single further work to be composed after his arrival in Paris. Perhaps he held K296 back because he had decided to dedicate it to Therese Pierron, the fifteen-year-old stepdaughter of his landlord in Mannheim, Councillor Anton Joseph Serrarius. Mozart and his mother were offered free lodgings with the Serrarius household, in exchange for piano lessons which Mozart was to give to Therese. Mozart referred to her on more than one occasion in letters to his father as ‘our house-nymph’, and was scathing about her pianistic abilities. At a musical evening held in her home on 14 January, Therese Pierron played a Mozart concerto she had been studying with the composer (probably the relatively undemanding C major, K246, which she is known to have performed the following month); and on 12 March, just two days before the Mozarts left Mannheim, she took part in a performance of the triple concerto, K242, together with Mozart’s future sister-in-law Aloisia Weber and another of his pupils, Rosina Cannabich. Mozart had presented Therese Pierron with the newly composed C major sonata, K296, the previous evening. However, it did not appear in print for a further three years, when it was included in a set of six violin sonatas inscribed to yet another of Mozart’s pupils, Josepha von Auernhammer. In the opening movement of K296 the piano assumes very much the primary role. Only in the central development section does the violin come briefly to the fore, with a sequential series of phrases arising out of a repeated-note idea heard during the exposition’s closing moments. The violin takes a back seat in the opening section of the warmly lyrical slow movement, too, with its characteristic two-against-three melody and accompaniment. But in the andante’s middle section the violin suddenly takes wing, with a new idea replete with soaring melodic leaps; and the start of the reprise is also given to the stringed instrument. But perhaps the most memorable of the three movements is the exuberant final rondo, where each successive idea seems to grow directly out of the last. The second of its themes turns rapidly from major to minor and back again, before its panting two-note phrases generate a new episode in the minor. A further new theme, in the key of F major, is introduced immediately after this, and the main rondo theme does not get a further look-in until the closing moments, immediately prior to the exuberant coda. The dedicatory preface to the sonatas K301–306 (they were inscribed to the Electress Elisabeth Maria) laid special emphasis on the fame of the Mannheim school of composers. Of the six works, it is the Sonata in D major, K306, that most overtly pays homage to their manner of composing. In particular, the recapitulation of its opening allegro begins not with the main theme, but with the second subject, reserving an abbreviated reprise of the forceful first subject for the closing bars—a typical Mannheim gesture. Since the second subject is conspicuously unstable, beginning, as it does, in the minor, and approaching its actual key only obliquely, the start of the recapitulation gives the impression that the development is actually continuing, and a firm return to the home key is considerably delayed. The theme of the slow movement, given out initially by the piano on its own, consists of two strongly contrasted halves: a gentle idea played mezza voce and anchored to a repeated pedal-note; and an outward-going, more richly harmonized phrase, with the bass now rising in octaves to counteract the descending melody-line. When the violin enters, it does so surreptitiously, with a solitary held note which seems to add resonance to the melody’s opening bars. Only gradually does the violin step into the foreground, to seize the initiative in the subject’s second half, and to expand it into a soaring, lyrical conclusion. No less remarkable are the exposition’s closing bars, which bring with them a hint of a miniature cadenza. Here, above another repeated pedal-note, the pianist’s right hand plays a series of winding phrases while the violin descends in a smooth, syncopated line, until the two instruments converge and proceed momentarily in parallel. Following a development section that is unusually elaborate for a slow movement, the recapitulation presents a version of the main theme whose second half is accompanied by intricate arabesques on the piano—a type of texture whose effect was not lost on Beethoven. If the sonata’s opening movement pays tribute to the Mannheim style, its concluding rondo is written in the French manner, with alternating themes in different tempi and metres. The principal rondo theme, given out by both instruments moving together in octaves, is a gentle allegretto. Its second half brings with it a suggestion of horns and trumpets on the piano, while a rapid repeated note on the violin adds a hint of timpani. The allegretto gives way without warning to a brilliant allegro in 6/8 time, designed in the manner of a sonata-form exposition. These two very different types of material proceed to alternate, before Mozart throws a large-scale cadenza into the melting pot. However, the trill that traditionally heralds the end of the cadenza is not resolved. Instead, an abbreviated return of the allegretto comes to rest with a single bar in adagio tempo that recalls the cadenza’s closing moments, before matters are swiftly wrapped up with a further fragment of the allegro. We now have the famous Strinasacchi from Mantua here—a very good violinist. She has much taste and feeling in her playing. I am just now writing a sonata which we will play together in the theatre on Thursday at her benefit concert. As had happened once before (with the G major sonata, K379), Mozart had so little time to compose the new work, the Sonata in B flat major, K454, that he was able to write out only the violin part before the concert, and had to play the piano part from compositional memory. That Mozart actually carried out this tour de force is confirmed by the appearance of the final manuscript of the work, in which the two parts are written in different inks. Moreover, at several points Mozart had not allowed himself sufficient room to fill in the more intricate passages of the piano part, and they consequently spill over the already ruled bar-lines. 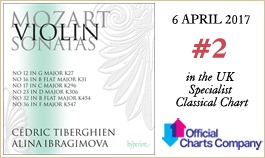 K454 is the first of the three large-scale masterpieces that form the crowning glory of Mozart’s series of sonatas for piano and violin. (Its successors are the E flat major K481 and the A major K526.) It is one of his grandest works of the kind, and the only example from his high maturity to begin with a slow introduction. That introduction lends imposing grandeur to the first movement as a whole, and enables the allegro to be set in motion with a quiet, yet urgent main theme. Despite the fact that the allegro itself contains a wealth of thematic ideas, Mozart chooses to base its central development section on new material, taking as his starting-point the tiny staccato cadence-figure that rounds off the exposition. The staccato idea makes a return in the coda, before a series of brilliant piano arpeggios brings the piece to a close. Mindful of Regina Strinasacchi’s fondness for slow, cantabile playing, Mozart originally designated the sonata’s middle movement as an adagio, though he subsequently altered the marking to andante. It is among his most profound slow movements, notable above all, perhaps, for the harmonic daring of the closing stage of its development section, where the music moves within the space of a half-dozen bars from B flat minor (the dark key in which the development begins) to a very remote B minor, and then threatens—but neatly sidesteps—an even more elliptical modulation into C minor. Mozart was to carry harmonic experimentation of a similar kind to a further extreme in the slow movement of the E flat sonata, K481. The final rondo is based on a gavotte-like theme with a repeated-note upbeat. The tempo is allegretto, rather than allegro, but Mozart nevertheless provides the sonata with a brilliant conclusion through the simple expedient of writing nothing quicker than quaver triplets until the final moments, where the pianist is suddenly confronted with a virtuoso flourish of semiquavers. Les premières sonates pour violon de Mozart, écrites au cours de la tournée européenne qui le conduisit avec sa famille à Paris, Londres et La Haye en 1763–66, furent ses premières compositions publiées. Elles diffèrent de ses œuvres de la maturité dans ce genre non seulement sur le plan stylistique, mais aussi parce qu’elles sont vraiment conçues comme des sonates pour clavier avec accompagnement de violon—forme populaire dans les milieux qui pratiquaient la musique en famille. Les quatre premières sonates (K6–9) furent publiées à Paris en février 1764, sous les op.1 et 2 de Mozart. La page de titre de chaque volume décrit avec fierté leur compositeur comme étant «Agé de Sept ans». L’année suivante, à Londres, Mozart vit publier son op.3—un recueil de six sonates (K10–15) pour clavecin avec violon ou flûte; et encore une demi douzaine d’œuvres du même genre (K26–31) parurent à Amsterdam, sous son op.4. C’est le 11 mars 1766, lorsque Mozart et sa sœur jouèrent aux célébrations du dix-huitième anniversaire du prince Guillaume d’Orange à La Haye, que «notre petit compositeur», comme l’appelait Leopold Mozart, fut invité à écrire cette dernière série pour la princesse Caroline. À l’exception de la première œuvre de la série, les sonates K26–31 sont toutes écrites en deux mouvements seulement. La Sonate en sol majeur, K27, commence par un mouvement lent dont la mélodie richement ornée semble se dérouler d’un seul trait. L’impression de continuité est encore renforcée dans la seconde partie du morceau où, en omettant toute reprise des premières mesures de la mélodie, Mozart effectue une transition sans heurts entre le développement et la réexposition. Le finale, avec son accompagnement de violon en un crépitement de notes rapides répétées, est une forme ternaire simple, avec une section centrale dans le mode mineur. Dans la dernière œuvre de jeunesse de ce genre écrite par Mozart, la Sonate en si bémol majeur, K31, c’est le second de ses deux mouvements—des variations sur un thème dans le style d’un menuet—qui a le plus de poids. La troisième variation comporte des sauts acrobatiques pour le pianiste, dont une main croise continuellement l’autre. Après le mouvement constant des doubles croches de la main droite dans la quatrième variation, la cinquième est syncopée du début à la fin. Le flot de doubles croches reprend dans la dernière variation, où il est transféré à la main gauche du pianiste, pendant que la main droite joue une version du thème décoré d’un bout à l’autre par des trilles. Une douzaine d’années allaient s’écouler avant que Mozart compose d’autres sonates pour violon. Lorsqu’il y revint, au cours des premiers mois de 1778, sa personne comme sa musique avaient subi des changements considérables. L’automne précédent, il était parti en voyage avec sa mère et ils s’étaient rendus à Munich, Mannheim et Paris. À Munich, Mozart était tombé sur les récentes sonates pour piano et violon d’un compositeur d’opéras très apprécié, Joseph Schuster, et leur succès l’incita à s’essayer à un recueil d’œuvres analogues de son cru. Des six sonates K301–306, quatre furent composées à Mannheim, alors que les deux dernières furent ajoutées après l’arrivée à Paris de Mozart et de sa mère, au cours de l’été 1778. Mozart avait toutefois écrit une autre sonate pour violon à Mannheim. On ignore pourquoi il choisit de ne pas inclure la Sonate en ut majeur, K296, dans cette série: après tout, il aurait très bien pu s’en servir afin de compléter les quatre pièces écrites à Mannheim, ce qui ne lui aurait laissé qu’une seule autre œuvre à composer après son arrivée à Paris. Il a peut-être gardé le K296 parce qu’il avait décidé de le dédier à Therese Pierron, la belle-fille âgée de quinze ans de son logeur à Mannheim, le conseiller Anton Joseph Serrarius. Mozart et sa mère se virent offrir un logement gratuit chez les Serrarius, en échange de leçons de piano que Mozart devait donner à Therese. À plusieurs reprises, Mozart fit allusion à elle dans des lettres adressées à son père comme «notre nymphe de la maison» et il était cinglant vis-à-vis de ses capacités pianistiques. Lors d’une soirée musicale chez elle, le 14 janvier, Therese Pierron joua un concerto de Mozart qu’elle avait travaillé avec le compositeur (sans doute celui en ut majeur, K246, pas très difficile, qu’elle joua, c’est avéré, le mois suivant); et le 12 mars, juste deux jours avant que les Mozart quittent Mannheim, elle participa à une exécution du triple concerto, K242, avec la future belle-sœur de Mozart, Aloisia Weber, et une autre de ses élèves, Rosina Cannabich. Le soir précédent, Mozart avait remis à Therese Pierron la sonate en ut majeur, K296, récemment composée. Toutefois, elle fut seulement publiée trois ans plus tard, quand le compositeur l’inclut dans un autre recueil de six sonates pour piano et violon dédié à encore une autre de ses élèves, Josepha von Auernhammer. Dans le premier mouvement du K296, le piano joue vraiment le rôle principal. C’est seulement dans le développement central que le violon commence un bref instant à s’imposer avec une série séquentielle de phrases émanant d’une idée en notes répétées entendue au cours des derniers moments de l’exposition. Le violon s’efface aussi dans la section initiale du mouvement lent au lyrisme chaleureux, avec sa mélodie binaire sur un accompagnement en triolets caractéristique. Mais dans la section centrale de l’andante, le violon s’envole soudain, avec une nouvelle idée truffée de sauts mélodiques qui grimpent en flèche; et le début de la reprise est également confié à l’instrument à cordes. Mais le plus mémorable des trois mouvements est peut-être l’exubérant rondo final, où chaque idée successive semble directement issue de la dernière. Le deuxième de ses thèmes passe rapidement du majeur au mineur, et inversement, avant que ses phrases haletantes de deux notes suscitent un nouvel épisode dans le mode mineur. Un autre nouveau thème, dans la tonalité de fa majeur, est introduit juste après, et le thème principal du rondo n’a pas la moindre chance de s’exprimer à nouveau jusqu’à la conclusion, juste avant l’exubérante coda. La préface en forme de dédicace aux sonates K301–306 (elles furent dédiées à l’Électrice Elisabeth Maria) mettait particulièrement l’accent sur la renommée des compositeurs de l’École de Mannheim. Des six œuvres, c’est la Sonate en ré majeur, K306, qui rend le plus ouvertement hommage à leur manière de composer. En particulier, la réexposition de son allegro initial débute non pas par le thème principal, mais par le second sujet, réservant une reprise abrégée de l’énergique premier sujet pour les dernières mesures—geste typique de Mannheim. Comme le second sujet est d’une instabilité flagrante, commençant dans le mode mineur et n’approchant sa tonalité réelle qu’indirectement, le début de la réexposition donne l’impression que le développement se poursuit, et le véritable retour ferme à la tonalité d’origine n’intervient que beaucoup plus tard. Le thème du mouvement lent, exposé au départ par le piano seul, se compose de deux moitiés très contrastées: une douce idée jouée mezzo voce ancrée sur une pédale répétée; et une phrase plus richement harmonisée et extravertie sur une basse qui monte maintenant en octaves pour contrebalancer la ligne mélodique descendante. Lorsque le violon entre, il le fait avec discrétion sur une note solitaire tenue qui semble ajouter de la résonance aux premières mesures de la mélodie. Le violon ne passe que petit à petit au premier plan pour prendre l’initiative dans la seconde moitié du sujet et le développer dans une conclusion lyrique pleine d’essor. Les dernières mesures de l’exposition ne sont pas moins remarquables, amenant avec elles un soupçon de cadence miniature. Ici, au-dessus d’une autre pédale répétée, la main droite du pianiste joue une série de phrases sinueuses alors que le violon descend dans une paisible ligne syncopée, jusqu’à ce que les deux instruments convergent et évoluent en parallèle. Après un développement très élaboré, ce qui est rare pour un mouvement lent, la réexposition présente une version du thème principal dont la seconde moitié est accompagnée par des arabesques complexes au piano—un genre de texture dont l’effet n’a pas échappé à Beethoven. Si le premier mouvement de la sonate rend hommage au style de Mannheim, son rondo final est écrit à la française, avec des thèmes alternant dans différents tempos et mètres. Le thème principal du rondo, exposé par les deux instruments qui évoluent ensemble en octaves, est un doux allegretto. Dans la seconde moitié, on trouve dans la partie de piano des sonorités qui évoquent les cors et les trompettes, tandis qu’une note rapide répétée au violon ajoute une touche de timbales. L’allegretto fait place soudainement à un brillant allegro à 6/8 conçu à la manière d’une exposition de forme sonate. Ces deux types de matériel très différents commencent à se relayer, avant que Mozart lance une cadence de grande envergure dans le melting-pot. Toutefois, le trille qui annonce traditionnellement la fin de la cadence n’est pas résolu. À la place, un retour abrégé de l’allegretto s’interrompt sur une mesure adagio qui rappelle les derniers moments de la cadence, avant que tout s’achève rapidement avec un autre fragment de l’allegro. Nous avons maintenant ici la célèbre Strinasacchi de Mantoue—une très bonne violoniste. Elle joue avec beaucoup de goût et de sentiment. Je suis juste en train d’écrire une sonate que nous jouerons ensemble au théâtre jeudi à son concert de bienfaisance. Comme c’était déjà arrivé une fois auparavant (avec la sonate en sol majeur, K379), Mozart avait si peu de temps pour composer la nouvelle œuvre, la Sonate en si bémol majeur, K454, qu’il ne réussit à écrire que la partie de violon avant le concert et dut jouer la partie de piano en la reconstituant de mémoire. Le fait que Mozart ait réalisé ce tour de force est confirmé par le manuscrit final, où les deux parties sont écrites avec des encres différentes. En outre, en plusieurs endroits, Mozart ne s’était pas laissé une place suffisante pour remplir les passages plus compliqués de la partie de piano et ils débordent donc sur les barres de mesure déjà tirées à la règle. Le K454 est le premier des trois chefs-d’œuvre d’envergure qui constituent le couronnement de la série de sonates pour piano et violon de Mozart (viennent ensuite la sonate en mi bémol majeur, K481, et celle en la majeur, K526). C’est l’une des œuvres les plus grandioses du genre et le seul exemple de sa pleine maturité commençant par une introduction lente. Cette introduction apporte une grandeur imposante au premier mouvement dans son ensemble et permet à l’allegro de démarrer sur un thème principal calme et pourtant pressant. Bien que l’allegro lui-même contienne une profusion d’idées thématiques, Mozart choisit de baser son développement central sur du matériel nouveau, avec comme point de départ la toute petite structure de cadence staccato qui conclut l’exposition. L’idée staccato revient dans la coda, avant qu’une série de brillants arpèges au piano mette fin à cette pièce. Sachant que Regina Strinasacchi avait une prédilection pour le jeu lent cantabile, Mozart conçut à l’origine le mouvement central de la sonate comme un adagio, qu’il modifia ensuite en un andante. C’est l’un de ses mouvements lents les plus profonds, surtout remarquable, peut-être, pour l’audace harmonique de la dernière phase de son développement, où la musique évolue au sein d’une demi douzaine de mesures de si bémol mineur (la sombre tonalité dans laquelle commence le développement) à un si mineur très lointain, puis menace—en l’évitant soigneusement—de moduler de manière encore plus elliptique en ut mineur. Mozart allait essayer de pousser une expérience harmonique du même genre encore plus à l’extrême dans le mouvement lent de la sonate en mi bémol majeur, K481. Le rondo final repose sur un thème de gavotte avec une levée en notes répétées. Le tempo est allegretto, plutôt qu’allegro, mais Mozart donne néanmoins à la sonate une brillante conclusion par le biais d’un expédient simple consistant à ne rien écrire de plus rapide que des triolets de croches jusqu’aux derniers moments, où le pianiste est soudain confronté à un déferlement de doubles croches plein de virtuosité. Die frühen Violinsonaten Mozarts, die während der Konzertreise der Mozartfamilie 1763–66 nach Paris, London und Den Haag entstanden, waren die ersten Werke des jungen Komponisten, die veröffentlicht wurden. Sie unterscheiden sich von seinen reifen Stücken für diese Besetzung nicht nur in stilistischer Hinsicht, sondern auch in ihrer Anlage: die Frühwerke sind als Cembalosonaten mit Violinbegleitung konzipiert—eine beliebte Form für die Hausmusik jener Zeit. Die ersten vier Sonaten (KV6–9) erschienen in Paris im Februar 1764 als Mozarts Opus 1 und 2. Auf den Titelseiten steht jeweils der stolze Kommentar, dass der Komponist „Agé de Sept ans“ sei. Im folgenden Jahr wurde Mozarts op. 3 in London veröffentlicht—ein Zyklus von sechs Sonaten (KV10–15) für Cembalo mit Violine oder Flöte; und sechs weitere Werke (KV26–31) wurden in Amsterdam als op. 4 herausgegeben. Mozart und seine Schwester waren anlässlich des 18. Geburtstags von Prinz Wilhelm von Oranien am 11. März 1766 in Den Haag aufgetreten, woraufhin „unser kleiner Komponist“ (wie Leopold seinen Sohn nannte) gebeten wurde, diesen letzten Zyklus für Prinzessin Karoline zu schreiben. Die Sonaten KV26–31 sind, mit Ausnahme des ersten Werks, zweisätzig angelegt. Die Sonate G-Dur, KV27, beginnt mit einem langsamen Satz, dessen verzierte Melodie sich sozusagen innerhalb eines einzigen Pinselstriches entfalten zu scheint. Dieser Eindruck von Kontinuität wird in der zweiten Hälfte des Stücks verstärkt, wo Mozart ein nahtloser Übergang von der Durchführung zur Reprise gelingt, indem er jegliche Wiederholung der Anfangstakte vermeidet. Das Finale steht in einer schlichten dreiteiligen Form—der Mittelteil in Moll—und die Violinbegleitung besteht in erster Linie aus schnellen Tonrepetitionen. Die Sonate B-Dur, KV31, ist das letzte Frühwerk Mozarts dieser Art. Ihr Schwerpunkt liegt im zweiten (und letzten) Satz, welcher aus Variationen über ein menuettartiges Thema besteht. In der dritten Variation kommen akrobatische Sprünge für den Pianisten mit zahlreichen Handüberkreuzungen vor. Nach der konstanten Sechzehntelbewegung der rechten Hand in Variation Nr. 4 ist die fünfte durchweg synkopiert. In der letzten Variation wird der Sechzehntelstrom wieder aufgenommen und in die linke Hand des Pianisten verlegt, während die rechte eine mit Trillern versehene verzierte Version des Themas spielt. Es sollten 12 Jahre vergehen, bevor Mozart sich weiteren Violinsonaten widmete. Als dies zu Beginn des Jahres 1778 geschah, hatten sowohl er als auch seine Musik entscheidende Veränderungen durchgemacht. Im Herbst des vorherigen Jahres hatte er zusammen mit seiner Mutter eine weitere Reise in Angriff genommen, die sie nach München, Mannheim und schließlich Paris führte. In München stieß Mozart auf die kurz zuvor entstandenen Violinsonaten des populären Opernkomponisten Joseph Schuster, und deren Erfolg regte ihn dazu an, sich ebenfalls an derartigen Werken zu probieren. Von den sechs Sonaten KV301–306 entstanden vier in Mannheim und die letzten beiden wurden im Sommer 1778 hinzugefügt, als Mozart und seine Mutter in Paris angekommen waren. Mozart hatte jedoch bereits in Mannheim eine weitere Violinsonate komponiert—weshalb er die Sonate C-Dur, KV296, in den Zyklus nicht miteinbezog, ist unklar; hätte er sie den vier anderen Mannheimer Werken hinzugefügt, hätte er in Paris nur noch eine komponieren müssen. Möglicherweise hielt er KV296 zurück, weil er sie Therese Pierron widmen wollte. Therese war die 15-jährige Stieftochter des Mannheimer Hofkammerrats Anton Joseph Serrarius, in dessen Haushalt Mozart und seine Mutter untergebracht waren. Als Gegenleistung gab Mozart Therese Klavierunterricht. In Briefen an seinen Vater bezeichnete Mozart sie mehrfach als „unsere haus-Nymphe“ und äußerte sich vernichtend über ihre pianistischen Fertigkeiten. Im Rahmen eines Musikabends, der am 14. Januar im Hause Serrarius veranstaltet wurde, spielte Therese Pierron ein Solokonzert von Mozart, das sie unter Anleitung des Komponisten einstudiert hatte (wahrscheinlich das relativ anspruchslose C-Dur-Konzert, KV246, welches sie bekanntermaßen im folgenden Monat aufführte); und am 12. März, nur zwei Tage, bevor die Mozarts Mannheim verließen, nahm sie zusammen mit Mozarts zukünftiger Schwägerin Aloisia Weber sowie einer weiteren Schülerin, Rosina Cannabich, an einer Aufführung des Tripelkonzerts KV242 teil. Am Abend zuvor hatte Mozart Therese Pierron seine neukomponierte C-Dur-Sonate KV296 präsentiert, welche jedoch erst drei Jahre später im Druck erschien, und zwar als eine von sechs Violinsonaten, die wiederum einer anderen Mozartschülerin, Josepha von Auernhammer, gewidmet waren. Im ersten Satz von KV296 übernimmt das Klavier die Hauptrolle. Erst in der Durchführung tritt die Geige kurz mit sequenzartigen Phrasen, die sich aus einem Repetitionsmotiv vom Ende der Exposition ergeben, in den Vordergrund. Auch zu Beginn des warm-lyrischen langsamen Satzes nimmt die Geige sich mit ihrer charakteristischen zwei-gegen-drei-Melodie und Begleitung bescheiden zurück. Im Mittelteil des Andante schwingt die Geige sich jedoch plötzlich empor—es erklingt ein neues Motiv mit aufsteigenden melodischen Sprüngen; der Beginn der Reprise ist ebenfalls dem Streichinstrument gewidmet. Der denkwürdigste der drei Sätze ist jedoch wohl das überschwängliche Schlussrondo, wo alle aufeinanderfolgenden Motive direkt aus dem jeweils vorangehenden zu entstehen scheinen. Das zweite Thema wechselt schnell von Dur nach Moll und wieder zurück, bevor keuchende Zweiton-Figuren eine neue Episode in Moll erzeugen. Ein weiteres neues Thema, diesmal in F-Dur, wird direkt danach eingeführt und das Rondo-Hauptthema kommt erst ganz am Ende noch einmal zu Wort, direkt vor der ausgelassenen Coda. In dem Widmungsvorwort zu den Sonaten KV301–306 (die sogenannten „Kurfürstin“-Sonaten sind Elisabeth Auguste von Pfalz-Bayern zugeeignet) wird der Ruhm der Mannheimer Schule betont. Von den sechs Werken ist es in erster Linie die Sonate D-Dur, KV306, in der dem Mannheimer Stil Tribut gezollt wird, und dort insbesondere in der Reprise des ersten Satzes, Allegro, der nicht mit dem Hauptthema beginnt, sondern mit dem zweiten Thema, wobei eine verkürzte Reprise des energischen ersten Themas für die Schlusstakte reserviert wird: eine typisch Mannheimer Geste. Da das zweite Thema auffallend instabil ist—es beginnt in Moll und nähert sich der eigentlichen Tonart nur indirekt—, wirkt die Reprise zunächst wie eine Fortsetzung der Durchführung, und eine entschiedene Rückkehr zur Grundtonart ist deutlich verzögert. Das Thema des langsamen Satzes, welches zunächst nur vom Klavier gespielt wird, besteht aus zwei gegensätzlichen Hälften: ein sanftes Motiv, das mezza voce erklingt und in einem wiederholten Orgelpunkt verankert ist, und eine extravertierte, stärker harmonisierte Phrase, deren Bass nun in Oktaven aufsteigt, um der abwärts gerichteten Melodielinie entgegenzuwirken. Wenn die Geige einsetzt, geschieht das fast unbemerkt—ein einzelner Halteton scheint zunächst lediglich den Resonanzraum der Anfangstakte der Melodie zu erweitern. Erst allmählich bewegt die Geige sich in den Vordergrund, um in der zweiten Hälfte des Themas die Initiative zu ergreifen und es in einen emporsteigenden, lyrischen Abschluss auszudehnen. Nicht weniger bemerkenswert sind die Schlusstakte der Exposition, die eine Mini-Kadenz andeuten. Hier windet sich die rechte Hand des Pianisten über einem weiteren wiederholten Orgelpunkt empor, während die geschmeidige, synkopierte Linie der Geige abwärts gerichtet ist, bis die beiden Instrumente zusammenfinden und einen Moment lang im Parallelgang spielen. Nach der Durchführung, die für einen langsamen Satz ungewöhnlich ausgeschmückt ist, erklingt in der Reprise eine Version des Hauptthemas, dessen zweite Hälfte von komplexen Arabesken des Klaviers begleitet wird—eine Faktur, die Beethoven nicht verborgen blieb. Wenn mit dem ersten Satz der Sonate dem Mannheimer Stil Tribut gezollt wird, so steht das Schlussrondo mit alternierenden Themen, Taktwechseln und unterschiedlichen Tempi im französischen Stil. Das Haupt-Rondothema, ein sanftes Allegretto, wird von beiden Instrumenten gespielt, die sich zusammen im Oktavabstand bewegen. In der zweiten Hälfte dieses Themas werden in der Klavierstimme Hörner und Trompeten angedeutet, während die schnellen Tonrepetitionen der Violine für einen Anflug von Pauken sorgen. 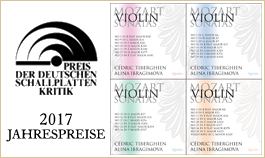 Das Allegretto geht ohne Vorwarnung in ein brillantes Allegro in 6/8 über, welches als Sonatensatz-Exposition angelegt ist. Diese beiden völlig unterschiedlichen Materialtypen alternieren miteinander, bis Mozart eine großangelegte Kadenz in den Ring wirft. Jedoch ist der Triller, der normalerweise das Ende der Kadenz signalisiert, nicht aufgelöst. Stattdessen kommt eine verkürzte Wiederholung des Allegretto in einem einzigen langsamen Takt zur Ruhe, der an das Ende der Kadenz erinnert. Darauf wird das Stück rasch mit einem weiteren Allegro-Fragment abgeschlossen. Hier haben wir nun die berühmte Mantuanerin Strinasacchi, eine sehr gute Violinspielerin; sie hat sehr viel Geschmack und Empfindung in ihrem Spiele.—Ich schreibe eben an einer Sonate, welche wir Donnerstag im Theater bey ihrer Akademie zusammen spielen werden. Ebenso wie es bei der G-Dur-Sonate KV379 passiert war, hatte Mozart so wenig Zeit, das neue Werk, die Sonate B-Dur, KV454, zu komponieren, dass er bis zum Konzert nur die Violinstimme notieren konnte und den Klavierpart aus dem Kopf spielen musste. Dass Mozart diese Glanzleistung tatsächlich vollbrachte, findet sich im Manuskript des Werks bestätigt, wo die beiden Stimmen jeweils in unterschiedlicher Tinte notiert sind. Hinzu kommt, dass Mozart sich an mehreren Stellen nicht genügend Platz gelassen hatte, die komplexeren Passagen des Klavierparts auszuschreiben, so dass diese über die bereits gezogenen Taktstriche hinausgehen. KV454 ist das erste von drei großangelegten Meisterwerken, die den Mozart’schen Sonaten für Klavier und Violine die Krone aufsetzen (die Folgewerke sind die Es-Dur-Sonate KV481 und die A-Dur-Sonate KV526). Sie ist eine seiner großartigsten Kompositionen dieser Art und die einzige aus seinem Spätwerk, welche mit einer langsamen Einleitung beginnt. Diese Einleitung verleiht dem gesamten ersten Satz besondere Pracht und ermöglicht gleichzeitig dem Allegro, trotz seines drängenden Themas, leise zu beginnen. Obwohl das Allegro selbst zahlreiche thematische Ideen enthält, führt Mozart in der zentralen Durchführung neues Material durch, das als Ausgangspunkt für eine kleine kadenzartige Staccatofigur dient, die die Exposition abrundet. Jene Staccatofigur kehrt in der Coda des Satzes zurück, bevor das Stück mit einer Reihe brillanter Klavier-Arpeggien beendet wird. Um Regina Strinasacchis Vorliebe für das langsame, kantable Spiel nachzukommen, legte Mozart den mittleren Satz der Sonate ursprünglich als Adagio an, bezeichnete den Satz allerdings später als Andante. Es ist dies einer seiner tiefgründigsten langsamen Sätze, der vielleicht in erster Linie für die harmonische Kühnheit des letzten Teils der Durchführung bemerkenswert ist, wo die Musik sich innerhalb weniger Takte von b-Moll (die düstere Tonart, in der die Durchführung beginnt) in ein äußerst entlegenes h-Moll bewegt und dann droht, eine noch abseitigere Modulation nach c-Moll in Angriff zu nehmen, diese letzten Endes jedoch geschickt vermeidet. Im langsamen Satz der Es-Dur-Sonate KV481 sollte Mozart ähnliche harmonische Experimente noch weiter führen. Dem Schlussrondo liegt ein gavotteartiges Thema zugrunde, welches mit Tonwiederholungen beginnt. Die Satzbezeichnung lautet Allegretto anstatt Allegro, doch Mozart schließt das Werk trotzdem in brillanter Weise ab, indem er bis zum Schluss nichts Schnelleres als Achteltriolen schreibt und dann den Pianisten plötzlich mit einer virtuosen Sechzehntelgeste konfrontiert.